It was half past one on a rainy Monday. I was at work with my wife in our shop, in the centre of Oxford. Trade had been slow and the day was beginning to drag. My wife turned to me and smiled. With a knowing look, she said: "It's quiet today, why don't you take the rest of the day off and go fishing?" Like most fisherholics, I needed no second invitation. I was out the door before she could change her mind. Normally this would be the start of my mental dilemma. Should I take the hour and a half drive down to Hampshire and try for a biggie, or make the short trip over to Farmoor for a spot of buzzer fishing? Or I could always try and blag an afternoon on a local trout stream. But today I know exactly where I wanted to fish - and what I want to catch. 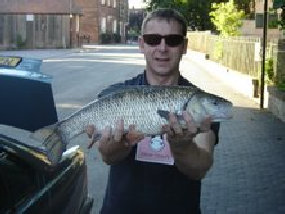 I would be heading back into Oxford, to a nondescript overflow of the River Thames, to fish for Chub. I had been tipped off about this spot when I was the manager at Lechlade Trout Fishery. I have lived in Oxford all my life and I had driven past the stretch of water hundreds of times, yet I had never given it a second glance. 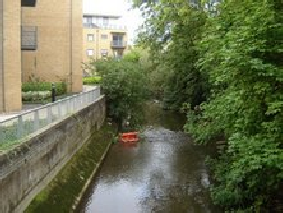 The Castle Mill Stream is a small stretch of water which flows off the main river. Originally it was used to top up the Oxford canal, as well as supplying water to power the water wheel for Morrals brewery. The beat - if you can call it that - which I was hoping to fish starts behind Oxford castle, where two sluice gates control the level of the Oxford canal. Below the sluice gates is a small pool, at the tail the water shallows up and runs clear until it rejoins the main river a mile or so away. 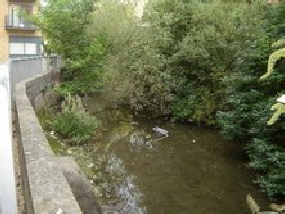 Access to the water is very limited, as the stream runs under main roads and through a local college. All of the fishing is from either the public highway or from foot paths, both of which are at least six feet above the water. I to like fish from this elevated position, as it offers a great view into the water. After a short bus ride home, I packed my tackle into my car and I was on my way back into town. By the time I had parked my car in the council car park outside the ice skating rink, the sun was out and the rain had disappeared. From the car park I crossed the Oxpens Road and made my way towards the first fishable spot. Downstream from the main pool is a smaller tree-lined pool where the water enters the college and access is limited. I had seen fish in this pool before, but none of any size. As I walked a long the public footpath that runs along side the pool, I looked through each gap in the trees. When I reached the largest gap, I slowly peered over the edge of the bank. Just below me, three feet from the bank, sat two of the largest chub I had seen in this stretch of water. Both were well over 4lb. I backed off out of sight of the fish, and prayed neither of them had seen me. Well out of sight of my quarry, I quickly tackled up my 5wt 8.8ft Wychwood Ionica rod. When fishing this stretch of water I use a short length of 10lb Cortland leader. Here the water is full of all sorts of snags, old shopping trolleys and the like. Chub are not the hardest of fighting fish, but in water like this, control must be gained quickly. In my experience, the thickness of leader makes very little difference to catch rates. If the chub feel safe and the fly is presented well, the fish will take the fly regardless of the leader diameter. Over the past few weeks I had caught most of my fish using large bushy dry flies, fished on the top or just subsurface, the latter being the most successful. But fearing I might only get one good shot at these two, before I spooked them, I picked out a large gold head Daddy longlegs. With my rod in one hand and my net in the other, I crawled back to the opening in the trees. To my delight, both fish were still there, oblivious to my presence. I pulled a short length of line from my reel and flicked the fly out into the pool. It landed two feet in front of the fish, but a little short. If I was on a stillwater, stalking trout, I would have recast and repositioned the fly closer to the fish. For a second I thought of pulling the fly out and casting again. This was short-lived, as the larger of the two fish had seen the fly drop down in the water column and she was on it like a flash. Her big white lips opened and sucked the fly in. You must strike quickly when fishing for chub. Takes are can be so gentle, the fly is not always taken down, chub seem to hold the bait in their lips, checking whether it is an edible food item or not, expelling any thing it does not like the feel of. Without hesitation I strike, and the hooked fish makes its way towards a large old sunken water boiler. Chub are the masters at finding snags. I rise to my feet, and apply as much pressure the rod would allow, stopping the chub in its tracks. 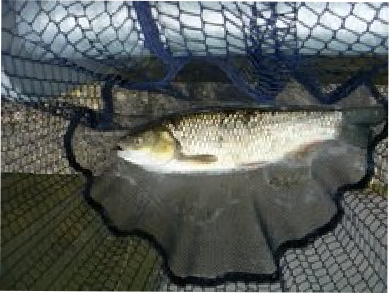 After a short but dogged fight the chub was soon under control and ready for the net. 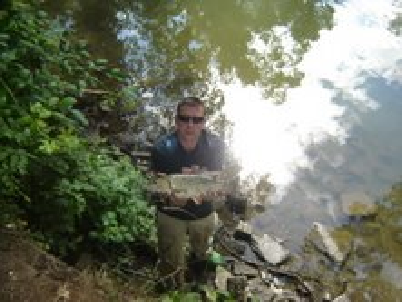 As with all fishable stretches on this stream, landing fish is harder than hooking them. There I was, seven feet above a small mud flat. The fish was way too big to lift out, so down I would have to go. I closed my eyes and jumped, luckily I missed the large broken bottle, landing ankle deep in the soft mud. Within seconds the beaten chub was in my net, and I was a happy chappie. Chub are one of the most easily spooked of all fish, the disturbance of a large fish splashing around in the shallows, had forced the rest of the fish in the pool to beat a hasty retreat beneath the nearest overhanging tree roots. It would be a waste of my time to carry on, it is much better to move on, giving the pool time to recover. I have found it is almost impossible to take any more than two fish out of any swim, before the swim is spooked, and the rest of the fish uncatchable. By leaving the swim and returning after 15 minutes or so, life in the pool will return to normal, giving you another chance. Between the pool I had had just fished and the main weirpool is a short stretch of clear shallow glides, but it's impossible to land any fish over a pound, as there is no access to the water. The river is lined by a 10ft high concrete wall. I have had great fun in this stretch, fishing for the smaller fish, using very small size 22 CDC emergers. As soon as the fly hits the water it is mobbed. Takes are so fast that I miss far more than I connected with. I find great satisfaction fishing this way; it is a lot harder and needs more skill to capture these lightening fast fish. Shoals of baby chub mingle with fly loving dace. A small pink shrimp works well here. By fishing the shrimp down the middle of the main current, the fly will pass shoals of small hungry small fish. At first they all will rush at the fly, looking, mouthing and sometimes swallowing it. Missed takes are common. The second run through the fly will again come under close inspection, takes will be less than the first run through, but there is still a very good chance of a fish. At no time will you feel anything, nor will the leader loop show any sign that the fly is in the mouth of a fish. All fishing MUST be by sight, striking when you can see the fly in the fish's mouth. At most you will get three or four casts at a pod of fish before they become wary of the fly and start to ignore it. At this point all is not lost. By changing the fly or changing its colour, you give the swim time to relax, and when presented with your new fly the same fish react like they had never seen a fly before. This trick works well for both big and small fish alike. Earlier in the year when fishing over a group of 2lb plus fish, I had been fishing a good looking mayfly. At first the fish showed interest but after missing a good take, the shoal became oblivious to the fly, moving out of its path. By changing the fly, in this case to a large claret daddy longlegs, two casts later the fly was taken by the same fish I had pulled out of with the Mayfly. 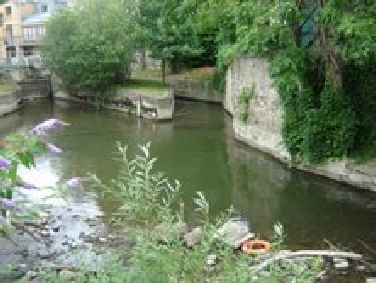 I was now standing on the footpath looking out over a small weir pool in the shadow of Oxford castle. Most fly fishermen would not give the pool a second glance, but over the past few months it had become my favourite haunt, yet to let me down. Caution is required at all times, this maybe a very quite part of the city, but this is very much urban fishing, with the main road behind me, and the odd pedestrian taking a short cut to the shops. 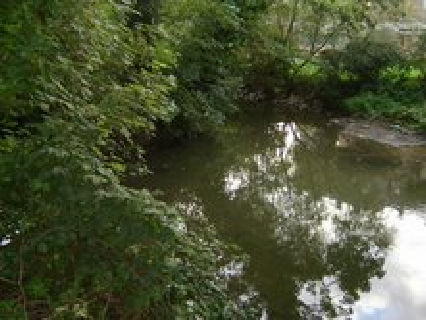 The lack of rain last summer had dropped the water level of all the rivers throughout the Thames valley region. The small pool was suffering, too. On opening day of the coarse season, water had been running over both the sluice gates, the water then was at least two feet higher than now. With a substantial push of water, the shoal of large fish had stationed themselves at the tail of the pool, waiting for food items to be flushed up the drop off, by the strong currents. The dynamics of the pool is shaped by the flow of water from one or both of the sluice gates. Fish lie in the position that favours them the most. I found them hard against the wall on the far side of the pool, sitting in the main flow. Here there was oxygenated water and the first opportunity at any food item caught up in the white water. From my lofted position on the footpath, the water in the pool was still not totally clear, I could only see into the top foot of water, at times I could just about make out the larger fish jostling with each other for the prime position. My plan was to cast into the white water just before it enters the pool, my fly would have to be as close to the far wall as I could manage. For this pool my set up is quite simple, a weight forward 5wt line with at most seven feet of leader. As for my choice of fly, it is quite simple. A BIG AND BUSHY DRY FLY. My favourite is the big bodied Shaddow Mayfly. Which is both effective, fished off the top and also subsurface. It is also bright enough to be seen at distance, even below the surface. I find this the most important aspect of fishing for chub; you must be able to see the fish take the fly. 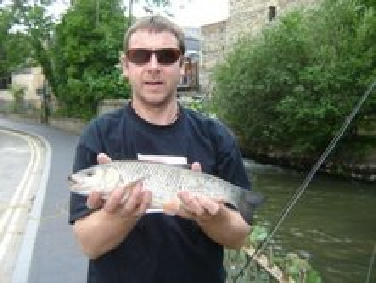 It is not impossible to fish blind for chub, but I am sure due to the very gentle takes you get from chub, bites are not always registered and therefore missed. I have certainly increased my success rate by stalking and watching for the fish to take the fly. Two false casts and my fly bounces off the stone wall and lands in the fast water. From where I was standing, I could just about make out the faint shapes of the shoal of chub against the far wall. As my fly came closer to the concrete ledge at the entrance to the pool, my heart began to beat faster, for I was sure it would be taken. But a back eddy in the pool had caught my fly line and before the fly had chance to enter the pool, the fly was pulled off course, way out of the taking zone. The chub showed no interest in the fly as it entered the pool. To avoid the line tow from happening again I moved a little to my right. The following cast saw the fly land at the foot of the stone wall, a yard in front of the entrance to the pool. As the fly entered the pool a large set of white lips loomed from the depths. I knew the fish were there, but I was never totally sure when the take would come. The fly came closer and closer to the fish, and then, just when I was sure the fish would take the fly, it turned its head slightly and the moment was gone. The fish behind the lead chub made no mistake, rising up to gently pluck the fly from the surface. When a chub takes a dry fly it does it with elegance and grace, beautiful takes which an angler could only dream of. As I struck into the fish, the water erupted. Chub disappeared in all directions, the chub on the end of my line was trying its hardest to reach the depths of the pool. Silvery, bronze flashes of the fish's flanks in the green depths of the pool gave me some idea of its size. Chub may not give their all like trout, but you must respect their size and initial power. By applying as much pressure as I dared, the fight was soon over, and I was the victor. 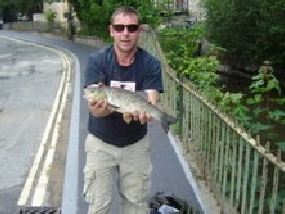 The beaten fish broke the surface; I quickly jumped over the railings and lowered myself down onto the concrete ledge to land a good fish of over 4lb.